DRINK ALERT: "GroovaLottos Summer Blues Chaser"
During our 2016 summer concert season, we actually had a drink named for us!!! Want a drink with a kick? A little something outside of our usual alcohol- free realm, but we know our fans are responsible folks. 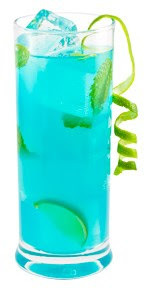 We also have a non-alcohol version of the "GroovaLottos Summer Blues Chaser". Shaken and poured over ice. Add lime and lime juice. *FOR ALCOHOL FREE, use White Grape Juice instead of Rum and Curacao with blue food coloring or blue Kool-aid for coloring.